These challenges offer amazing opportunities to show creativity and approach the show differently than done in the past. 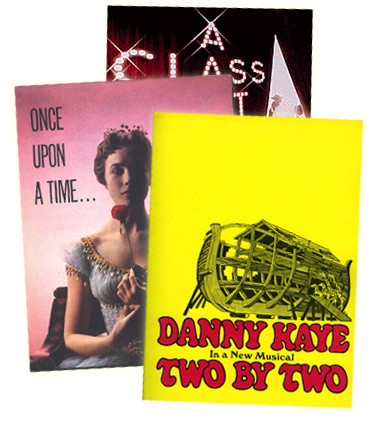 Here are examples of the imagination directors have brought to CARRIE the musical. We hope that they might spark your creativity. And when you hit upon a particularly inventive or memorable staging idea, we hope that you’ll share it with us so that we can add it to this blog! Gregory Daniels worked closely with director Victoria Bussert to create a highly physical show. GREGORY DANIELS: We decided to do the entire production with hip hop inspired dance (except for an invented pas-de-deux flashback with a young Margaret at the end of Act I). We felt its kinetic rhythms would bring out the teenage angst that had been so brilliantly written in the music. 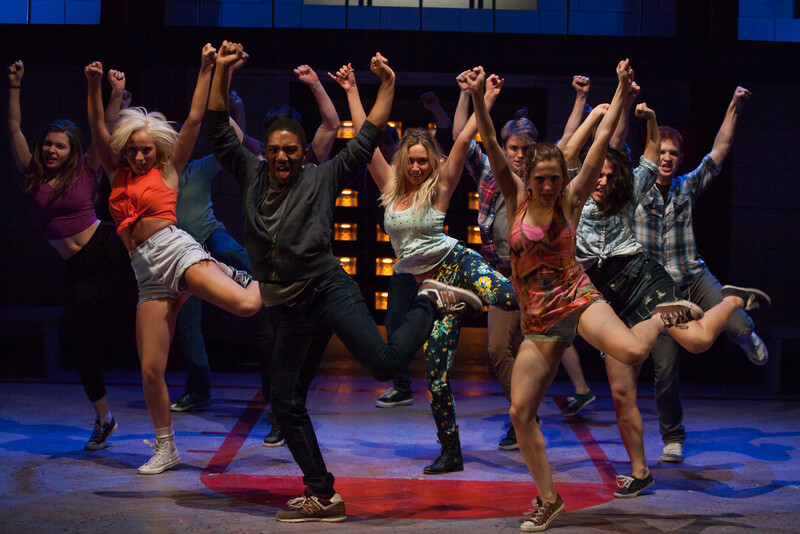 As Carrie is the outsider, we had the rest of the ensemble do “cool" kids moves -- like what the “in crowd" would do. The percussive moves also showed the frustrations that the kids were going through in their incredibly stressed lives as teenagers. It was insanely, athletically physical -- bruising, frenetic, intensely committed. GREGORY DANIELS: The show, due to Carrie's supernatural powers, presents some unusual challenges -- ways for us to manifest telekinesis, windows slamming, the iconic blood drop and the destruction. We did our best to address these technical problems and find theatrical solutions to accomplish the TK effects. A statue needed to be levitated and chairs had to mysteriously move and tilt. We brought in a magic consultant who employed invisible wires that were strategically placed to achieve the illusion of levitation, along with the use of strobes when these events occurred to help make them additionally credible and effective. 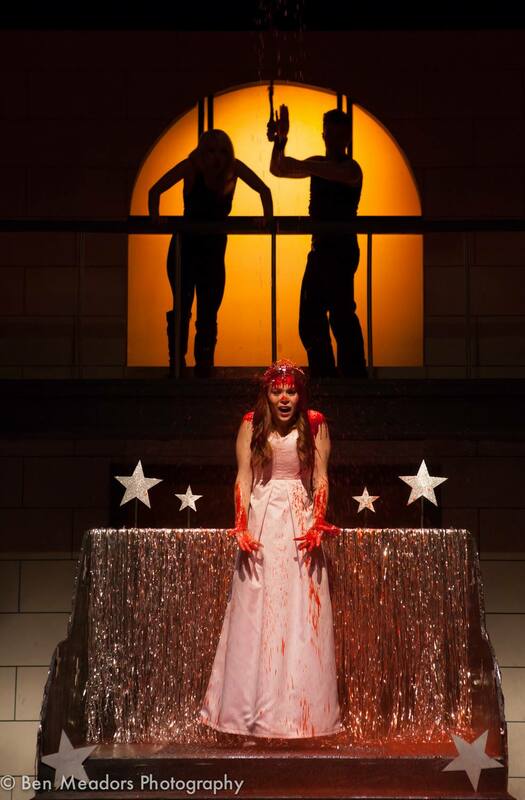 GREGORY DANIELS: The blood drop on top of Carrie is, of course, what everyone is anticipating. Jordan Janota designed a prom stage for the King and Queen coronation that had a grate on it. The blood would go through, leaving the stage floor dry for the destruction. The problem was to make sure that the blood fell in precisely the same place during every performance. Jordan designed a funnel-like system so that we knew precisely where it would fall each night, and Carrie knew exactly where to stand on the platform. Before this apparatus was designed, we had an evening of blood drop testing. Let's just say there was blood from one side of the stage to the other! Another major challenge was protecting Carrie's mic during the blood. I called a sound design friend who suggested that we waterproof it with two condoms (one from the bottom and one from the top) with a notch cut out for the connections. We also put a small piece of latex between the mic and mic cap. Our Carrie never had to interact with apparatus at all. She put it on at the top of the show and the sound was never affected. GREGORY DANIELS: The destruction was another challenging undertaking. It had to look as though Carrie was making everything happen. We really worked with the cast on their physical movements so it appeared as though they were being uncontrollably hurled about -- first slowly and then up to greater speed. Bodies were being thrown everywhere. We also accentuated the destruction with high-powdered strobes -- having, for example, one male student coming toward Carrie pushing a little table that was on wheels; then having her reach out at him, creating the illusion that her power was causing him to move backwards in the strobe like a silent movie. The fire afterwards was achieved through a rotating gobo and moving fire projections. BOBBY GARCIA: In general, I found that as daunting as some of the special effects moments seemed at the onset, making sure that they all stayed true to the tone of how we were choosing to tell this remarkable story really dictated how far we would go with each effect. BOBBY GARCIA: Thematically, I wanted to start the show off with the spirits/ghosts returning to the place that they perished, relive their lives, and watch their own deaths until their lessons were learned. Their journey echoes Sue's journey of the cycle never ending. We began with a cellphone’s "found footage" of the chaos at the prom on the T.V. screens, and then we framed the show with Sue's interrogation as seen on the TVs. The video content on the screens later helped establish the different scenes (from locker room to Chris's house, etc.) The only times we covered the TV screens were in the White home as I wanted no hint of modern technology there. Moment: In the library scene where Carrie reads about telekinesis and tries to control it for the first time, she causes a book cover to open... and then some pages to flip past. It's graceful and eerie and strangely beautiful. BOBBY GARCIA: What was originally supposed to happen was that the book was supposed to fly off the chair in one direction and then the chair would fly off in another direction. But because of how the book was rigged, pages fluttered before the book flew off the chair. We loved how it looked so much that we made sure we had that moment of the fluttering pages before the book went flying off the chair and the chair flew in another direction. Moment: End of Act I - "I Remember How Those Boys Could Dance" - when Carrie thrusts Margaret into an upstage chair, which then lifts her into the air. BOBBY GARCIA: I really wanted to end the act with a visual threat to Margaret so that Carrie's, "I am not afraid of you at all...." rang clear to her mother. So we decided to have Carrie flexing Margaret into a chair and then flexing her up into the air. Carrie then sang her lines as she held Margaret suspended off the ground. I felt it was a strong visual to show who was in charge now. It was remarkably easy to do with a simple counterweight system. Moment: The Destruction - Carrie, at the height of the Destruction, reached up at arches that appear to be the support beams of the gymnasium ceiling above, causing them to collapse one after another to create the "Phantom"-like illusion of the roof coming crashing down on the Prom-goers. 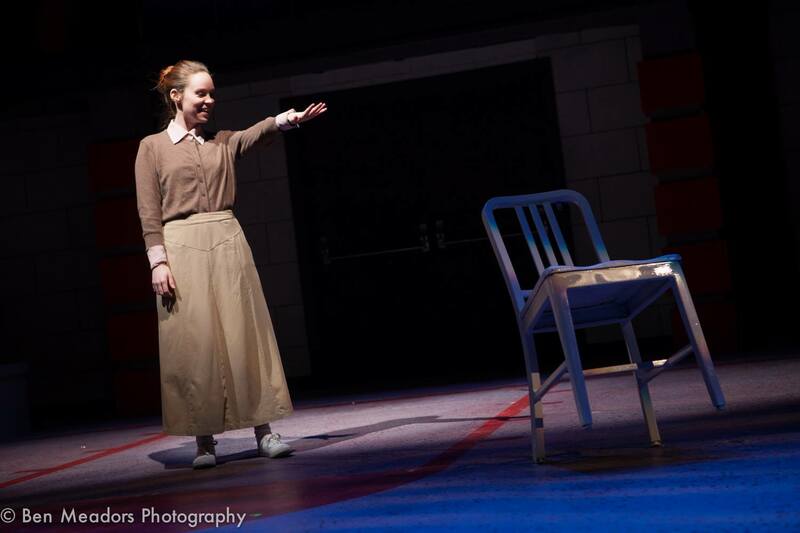 Moment: End of Act I - "I Remember How Those Boys Could Dance" -- Carrie flips the dining room table. JASON HOOVER: Our initial idea for the dining room table was to have it actually fly up into the air and then flip over. We had planned on doing this by turning the legs basically into pogo sticks, then rigging them to launch up. However, we ran out of time. So what we ended up with was the following: A thin steel wire was run from the underside front portion of the table out the back of the table and through the wall panel upstage. We then created blocks for the back of the table legs so they wouldn't skid when pulled. At the correct time, a crew member hidden upstage center behind the walls gave the wire a good pull and flipped the table over. Physics did all the rest. The table was far enough upstage that it remained hidden from the audience. 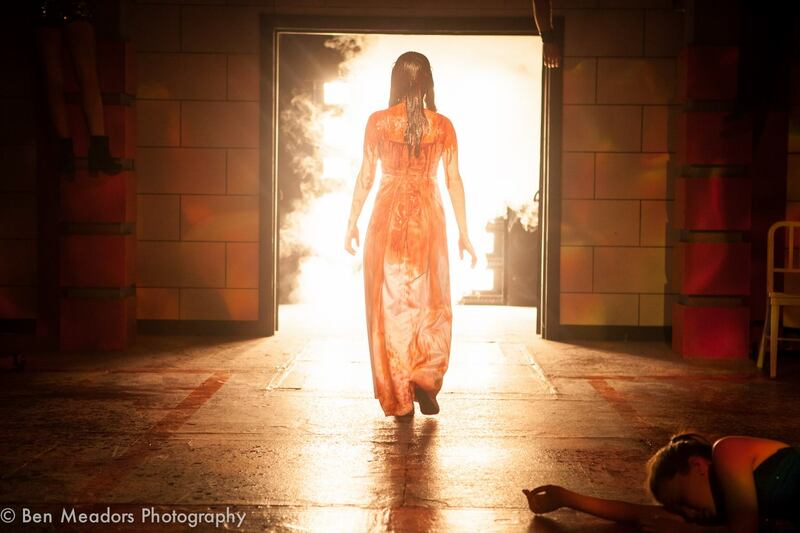 JASON HOOVER: For the iconic prom scene where Carrie ultimately retaliates, there is blood everywhere. 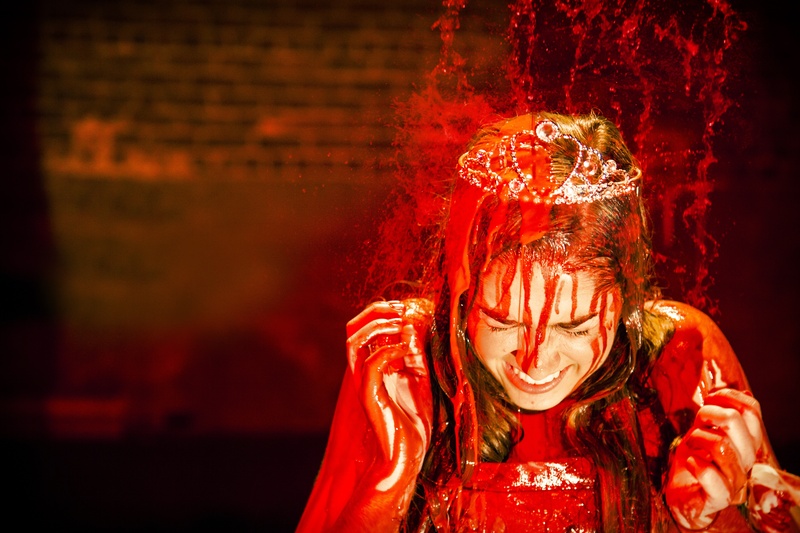 The sound designer, Anton Hedman, needed a way to conceal a mic on Carrie while they dumped about four gallons of blood on her head—right before the closing solo. We decided to use an E6i mounted to her tiara so we could conceal it. We positioned the mic face down and protected it with a simple funnel-shaped wrap of medical tape around the capsule and a solid wrap around the ear connection in order to repel most of the liquid. We were all amazed at how well it worked! Moment: The Destruction – During Carrie’s rant and subsequent massacre of the Kids, she and the cast moved downstage until they were all at or below the apron. At the final moment, the entire back wall of the stage fell face- down behind Carrie – missing her by inches. JASON HOOVER: The “Wall Fall,” as it became affectionately known, was actually the easiest of the tricks to pull off. The wall's dimensions were roughly 27 feet wide and 30 feet tall. It was created out of reinforced plywood (so we could actually hoist it up and reset it each night). It was attached to the back wall by a wire locking mechanism that was controlled electronically. So the release of the wall could only happen via a two-part button pressing system. At the right time, the buttons were pressed, a crew member gave the wall a little nudge, and away it went. Because it was so large, wind resistance kept it from coming down too fast. JASON HOOVER: We went about the knife two different ways. Initially, it was sheathed on a chair Margaret came onstage with. I eventually cut the chair and transferred the sheath to a pocket in her nightgown. We were careful to stage the scene so you couldn't see the knife's bulk in her gown. It also helped that the actresses in the scene were absolutely dynamite and people were hooked in. LOUIS HOBSON: Instead of using projections, we made a plan to fly in a 5 gallon bucket during the coronation with about a gallon of "blood" (a mixture of tempura paint, chocolate syrup, and soap) that had a trip wire attached to it. It worked as designed but did not get as much blood as we would have liked on Carrie. However, any more would have made the stage unusable for actors. We collected most of the blood in a stage unit that doubled as both a stage for Carrie and a collection trough for blood, but some always ended up on stage. We built the rolling unit with a grating on top and several collection bins underneath to collect the rest. LOUIS HOBSON: During the massacre scene we used 4 oz. travel bottles full of water for a blood spray effect from each actor that was very effective. Under red light it looked very real.If I were to do it over again, I would have used a mix of projections and just water under red light for the blood drop. That would have allowed more "blood" to come down and made it safer for the rest of the cast. We then would have changed her into her blood 2.0 look and dressed her with the prop blood. Blood is an awful thing to deal with on stage, and the more we can make sure it stays off those prom dresses and tuxes, the happier everyone is. Squabbalogic Independent Music Theatre - Sydney, Australia: "Evolution of The Blood Drop"
In promotion of the 2013 film release of CARRIE, Sony Pictures rigged a coffee shop with a telekinetic surprise. Since its release last October, this video has received a phenomenal 60 million hits -- #8 on YouTube's 2013's most hit-on video, and counting.